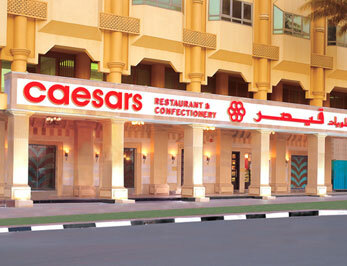 Caesars Restaurants and confectioneries in the U.A.E are owned by Mr. Ghazi Abdul Razzak and Mr. Lawrence D'souza. Caesars UAE established in 1989, today has grown from a single restaurant and confectionery to 10 restaurants and 19 confectionery. Caesars has earned many plaudits on the international scene like the BID.International star quality award(Geneva), The editorial office award (Madrid) for business excellence, OMAC Award (Berlin) for quality and business prestige, Council of International Award (UK) for best performance, Awards from Dubai & RAK Municipality.